I have been putting off the update on this project because I want to be able to show you all of the pictures, but it doesn’t appear that I can do that yet. I have NO idea why. I just successfully uploaded two pictures and now the rest of them don’t want to load. The time spent on the Warthog, what little there was, was spent installing servos and wiring up the wing. If I am correct in my knowledge, the servos are the electronic ‘motors’ that work to move the wing tips, pull in the landing gear (or move it back out) and other functioning things like that. They are little square things that get their own little spot in various places on the plane. These are connected to the batteries with a LOT of wire. All of this wire has to be snaked through the plane so that they aren’t hanging out like a tacky price tag that wasn’t cut off of your new shirt. In this picture you can see the servo next to Jay’s right hand, in the little well that he created. He is in the process of snaking the wires that will run from the servo to the battery. I think (and please don’t quote me because I could have this completely wrong) that the servo he’s hooking up will run the flap behind the wheel right there. This is the only picture that I can get to load, so please enjoy it. lol. 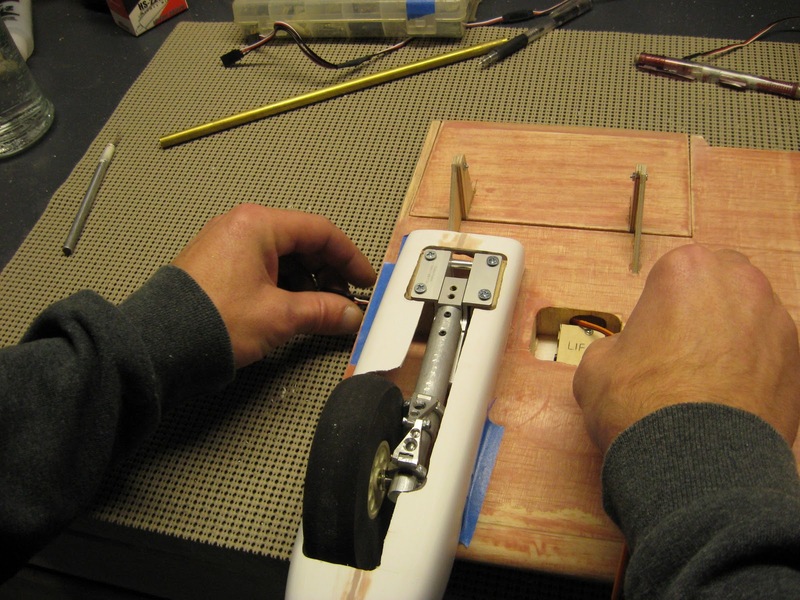 I really loved watching Jay as he wired up his plane. This one has so many working parts and other things happening that he has to plan it out perfectly how much wire he needs for it. He was very meticulous and careful, going so far as to label the wires so that he knew what went where. I was impressed! I’m sure that you would be, too, if you could see the pictures. Jay hasn’t had a lot of time to work on the ‘Hog, though. He’s been building planes for others as well. He has a really pretty blue Panther (I believe that’s the one) in his basement right now. It’s almost complete. One of the guys who used to fly in his RC group commissioned him to put it together. It looks really pretty and I’m sure that it will fly wonderfully as well.